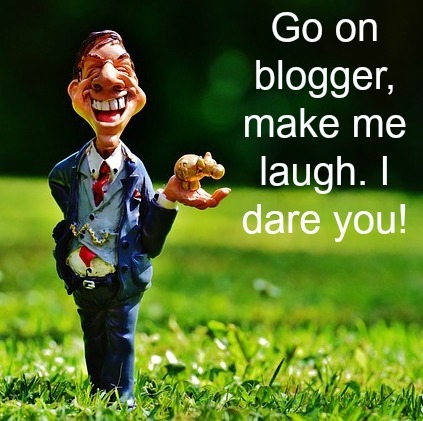 Are you a blogger desperately seeking content? Take a look at your life to brainstorm the next post. And because we all want and need a good laugh, let me suggest making fun of yourself — for the sake of entertainment, of course. Only a writer who is grounded and egoless can do this effectively. Unless, of course, they are desperate. I’ve been blogging for six years, and I’m always throwing in posts that reveal (shocker) my lack of perfection. For example, there’s the time I wrote about absent-mindedly walking into the men’s bathroom. Oops, my bad! I also wrote about the day I was coaching a group of students on the phone, and I caught my notes on fire. Can you believe that embarrassing moment actually revealed a coaching breakthrough? I share such cases, dear reader, because I want you to know that I am secure enough to reveal my awkward moments in life. Interestingly, Google analytics show that my humorous posts draw lots of readers. My take on that is that people like a reason to smile. And, I’m sure they see some of themselves in there somewhere. And while making fun of myself works, putting my family members on the spot is so much more fun — especially when it’s my husband. For example, there’s the time he was busted for lying about ordering a case of wine. And there was the time I returned in the wee hours of the morning after taking two of the boys to an out-of-state soccer tournament only to find about 20 dog poops in the boys’ bedroom. I had to rewrite that post umpteen times to edit out all the bad words. Let’s not forget our kids — they always provide fodder for content. Like this post about why hiring your kids to help with gardening is a bad idea. Family dogs are not excluded from public embarrassment either as you’ll see in this post about the family Westie being terrified of the garden gnome. Truth be told, when I’m hard up for content, I’ll look for humor just about anywhere. I’ve put my dear ole Dad on the spot in this post about his dentures. I’ve featured the unpleasant parents of players on the opposing school soccer team. I’ve even made fun of the Dalai Lama. So the next time you feel stuck creating content, look for anything that makes you smile. Or, anything that you can comically twist to make someone else smile, so long as you do it responsibly. In other words, be an entertaining writer with a kind heart. Humor goes a long way because it provides a reason for readers to feel better. Think of it this way, when you write something that indulges a reader, you are making the world a better place. If that’s not an inspiration to write, then I don’t know what is.